In this article, you will learn to use continue statement to transfer control of the program. How continue statement works in Swift? How continue statement works in case of nested loops? How labeled statement works with continue? The loop also contains an if statement with expression i == 4. The expression when evaluated to true (on 4th iteration) executes the continue statement, skips the execution of statement print("i = \(i)") and moves to the next iteration (i = 5). In the above program, the while loop runs until currentLevel is less than finalLevel. Since, intialLevel is assigned value -5 and is less than 0, statements inside the if executes. When the program reaches continue statement, it skips the statements of the while loop and jumps to check the condition currentLevel < finalLevel again. 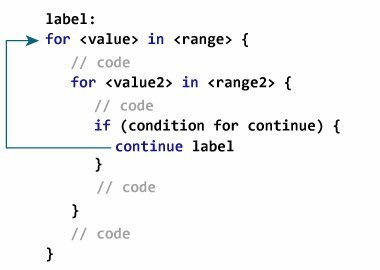 In the above program, continue statement inside the if i == 4 only skips the execution of statement print("i = \(i)") inside the inner for loop. However, it doesn't skip the execution of outer loop for i in 1...5. But, what if you want to continue the outerloop as well. For that, you need to use labeled statements in Swift. How labeled statement with continue works? Here, label is an identifier. 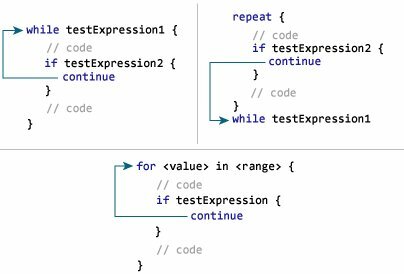 When continue statement executes, the program skips the rest of the coe inside the loop and jumps to the statement where label starts. The label names outerloop and innerloop can be used with the continue statement. In the program, we have used the statement continue outerloop to skip the execution of statements inside both inner and outer loops. In the process, values of both i and j are updated to the next number in the range.